Pick up your Free KTTS Storm Alert Map at area Big O Tires or at the KTTS Studios at 2330 West Grand in Springfield! Anytime a severe thunderstorm warning is issued for one of the metro counties in this zone, KTTS provides reports every ten minutes on the storm’s intensity and movement. If a tornado warning is issued for a metro county, KTTS begins continuous coverage on the potentially life-threatening emergency until the danger passes. These four counties border the immediate Metro area and, depending on storm movement, can threaten the Springfield Metro area. KTTS provides updates any time a severe thunderstorm warning or tornado warning is issued for a county in the Yellow Zone. 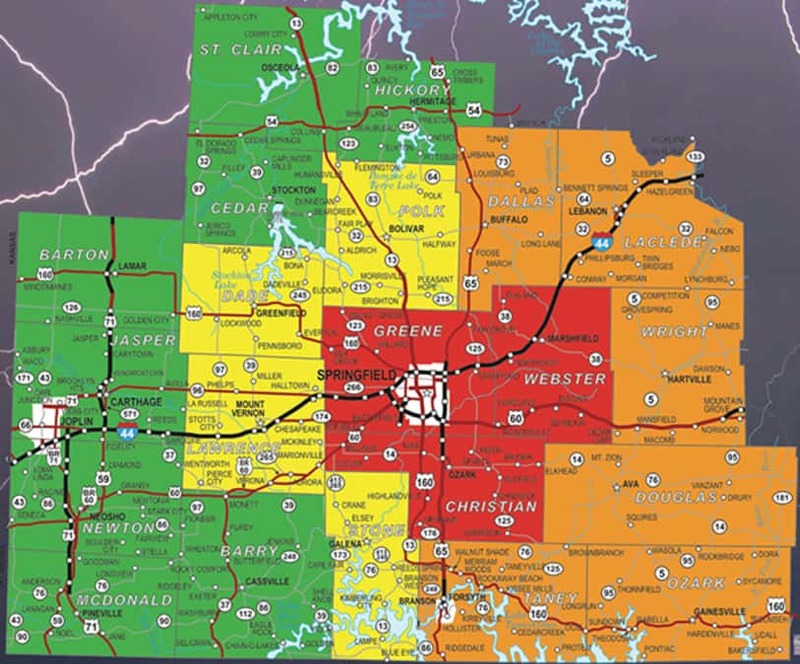 In order to serve listeners in outlying counties, KTTS begins to track severe storms while they are still located in the Green Zone, and will continue to provide coverage once storms have traveled beyond the Springfield Metro and into the Orange Zone.